There are many different options out there when it comes to a good survival saw, and truth be told when I started a batch of articles reviewing the best survival saws out there, the pocket chain saw wasn’t originally on the list. However after a few good videos, an order, and a field test, I’m a fan! As with any tools, there are pros and cons and if you’re going to buy it mine as well be from the list of the best pocket chain saws available. That being said, we went through all the options anyone recommended to us. So read on to learn more about the best pocket chain saws. So how did pocket chain saws jump into their current place? Bow saws and folding saws were on the list, but originally wire saws were going to be the third entry. However, upon seeing that the pocket chainsaw for survival was clearly a step above the old wire models that I was less than fond of – that made it an easy decision! To be honest, while interesting, early wire saws just were not a great option. I wanted to know more, so I decided to dive in and investigate! How Do Pocket Chainsaws Work? Here is a quick video demonstrating what one of these pocket chainsaws look like, how they work, and an in-field test so you can get a sense of what they’re about (rest of this article continues after the video with a quick reference table right after it). There are many different considerations that go into how we rate pocket chainsaws against one another. One is the quality of build. While other factors matter, if the materials used or the design is crap, then the rest doesn’t matter. The practical quality of design, ease of use (relatively speaking), quality of materials are the most important factors for us, hands down. Understanding that all of the following options meet those needs above all else, then we start looking at other things like pricing, ease of carry, how they are packaged, durability, and more. This article definitely focuses on the best options that are currently available. This is the top rated pocket chainsaw currently on the market, and an outstanding option when it comes to a solid survival saw option that is lightweight, easy to pack or carry, and will help get the job done when you need a survival cutting implement. The Sportsman pocket chainsaw, in our opinion, is the top overall option available on the market. One of the things that instantly leaps out about the Sportsman is the length. Most pocket chainsaws are 24 inches in length, but this one is 36. As someone who understands leverage and the need for versatility, that extra size matters! This is a three foot blade – that doesn’t even include the handles. This particular survival pocket saw is bi-directional. This means it cuts in both directions and “self-cleans” to remove saw dust and build up. This is extremely important because it makes it much easier to cut and that makes it a more thorough cut. The teeth of these saws are made from a very high heat carbon treated steel and that means sharp and deep cuts that you can rely on – a crucial detail when using a saw in a survival situation. This is an outstanding pocket chainsaw for cutting higher branches, working your way through thicker branches, and this particular saw even includes an 8mm fire starter. This really is a top notch example of what these saws can be. The LivWild pocket chainsaw for camping was the second of its kind that really caught my eye. And not just because of the bright orange handles, either! The LivWild survival pocket chainsaw is a very impressive model that has earned its place towards the top of our list. Bragging about featuring three times the teeth as the average pocket chainsaw, leading to a faster and more efficient cut. The large handles allow for a solid grip while the high quality blade means you’ll be able to cut through most wood with ease. This really is an impressively built pocket chainsaw. It cuts bi-directionally, which is a big plus for us, and is made from some really high quality industrial grade steel. The 26 inches of chain means plenty of length to work with. This can cut downed branches and trees as easily as overhead branches. In other words, it has the versatility you want from a quality survival saw. 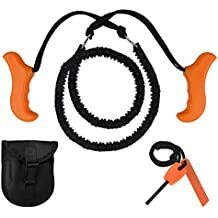 These saws are heavy duty in nature, with especially strong nylon handles in the classic “hunter’s safety vest” orange that also makes them a half way decent eye-catching signal in the wild. Because of the design, re-sharpening can be done with any standard round chainsaw file 3/16 size in length. 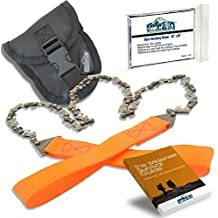 In addition to the saw itself, this is sold in a survival packet that includes a great pouch that your normal belt can loop right through as well as an emergency Mylar blanket and even a PDF survival guide ebook is emailed after purchase for knowledge and basic training. Add in a true 100% money back guarantee and you have a truly special pocket chain saw. The SUMPRI camping survival pack is something we really like because it’s two really high quality products that make sense together along with a practical carrying apparatus. They are good for survival, small on space but potentially huge on impact. We are good on all of these things. The SUMPRI survival kit has a strong and easy to carry little pouch that can carry both the quality pocket chainsaw as well as an all weather magnesium fire starter. That’s the perfect combo, allowing the collection of wood that can then be the basis for multiple campfires. The fire starter isn’t just a little cute piece of equipment to boost sales it is a practical piece of gear that goes hand in hand with an excellent pocket chainsaw and they can be used together in a survival situation. The SUMPRI is an excellent pocket chainsaw and it’s a 36 inch blade, which I personally prefer over the majority of 26 inch models, though this is a bit of a preference thing. However I like the versatility the extra length gives me, and it just feels like I get better leverage using these longer bi-directional blades. Strong with teeth made from heat treated steel, this is an outstanding saw and the choice of a magnesium fire starter is perfect – as this can work in any type of weather. 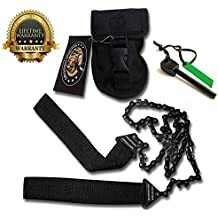 That is an outstanding combination, and when you through in that little carrying pack that is easy to loop into a belt and surprisingly strong considering it’s included free with this survival package. Coming with a 30 day 100% money back guarantee, we love everything about the SUMPRI Camping Survival Kit: pocket chain saw, magnesium fire starter, carrying belt pouch, and a money back guarantee beyond that – we’re sold! The SOS Gear pocket chainsaw is another high quality model that has earned its way on this list. The package comes with a high quality fire starter that even has a compass. 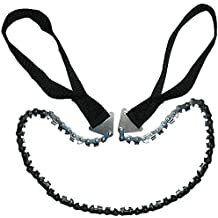 The pocket chainsaw itself comes in either the standard 24 inch model or the larger 36 inch design, so both options are available. The camouflage design of the handles is a nice aesthetic that makes it easy to blend in with the gear. Both sizes of the SOS portable chain saw are top quality. This means as long as you’re looking at small to medium tree limbs, this saw is going to be good to go. The teeth on this model are made from a steel and carbon alloy designed to be strong, sharp, and durable. These are designed for bi-directional cutting, which is a huge plus as far as we’re concerned. 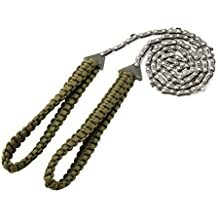 The strong nylon straps will hold up under pressure, and the magnesium fire starter, whistle, and compass that come with this pocket chain saw are nice bonuses. The saw comes with a lifetime manufacturer’s guarantee. This is an excellent addition to any emergency survival stash. The survival pocket chainsaw from Wealers is an outstanding model that focuses on the basics as opposed to the bells and whistles. This chainsaw comes with a basic carrying pouch that is easy to attach to any belt or even a single loop on blue jeans. The teeth of this saw are bi-directional meaning they cut on both push and pull, making it a more efficient design that is going to give you the absolute best performance you can expect. This is a great survival tool. Well made, this pocket chainsaw focuses on minimal binding. What does that mean? That means less energy to get the same level of cutting done. Less work for the same results is definitely a good thing. Portable, versatile, and ultra-lightweight, this hand drawn chainsaw is efficient and powerful. In addition to this, the blade teeth are coated specifically to help prevent rust and keep it in top notch condition no matter what the weather and over a longer period of time. Compact, budget friendly, and durable, there’s a lot to love about this model. At 25.5 inches there’s a good amount of flexibility here, though for those of us who like the 30 plus inch models that might be the only big drawback. However this is a survival saw that packs small, packs light at only 5 ounces, and offers plenty of functionality. Featuring large than average handles with plenty of loop space (a godsend for especially large handed individuals like me), the pocket chainsaw from We Do Lifestyles offers a solid model loaded with more cutting teeth. Featuring superior grips and a superior number of teeth creates an excellent emergency saw that is easy to carry around at takes care of all your cutting needs with bi-directional cutting teeth. Whether you’re packing for a bug out bag, rounding out your supply of quality survival gear, or preparing for a wilderness hike or emergency, this is a great option. There’s no doubt this design goes with the old mantra more is better, and if you’re looking for pure cutting power it’s hard to argue with what they’ve put together here. This multi-purpose manual saw is 24 inches in length and the nylon hand straps are designed to be comfortable and allow for a solid grip that isn’t going to come loose because of rain or sweat. The teeth can be easily resharpened with any standard sharpener for a chain saw blade. There are many great pocket chainsaws out there, and this one from Sportsman is another great example of a truly outstanding outdoor tool. Featuring a full thick 36 inch chain along with two solid nylon handles that offer both grip and flexibility, there’s a lot to love about what this saw brings to the table. Even setting aside the convenient storage/carrying pouch and a rock solid magnesium fire starter the saw itself is designed to be extremely durable and tough, able to handle branches and cuts that many other pocket chainsaws struggle to handle. With three feet of actual blade and large solid handles that allow you to take advantage of leverage, you can get the most out of this particular model. Resistant to rust, corrosion, and wear, there’s a lot to like about what the Sportsman Industries pocket chainsaw brings to the table. In addition to all this, the design allows for better posture, the ability to cut thicker limbs, and even attempts to save you energy as you cut. Obviously the saw is bi-directional and the extra thickness can really make a difference once you get into a rhythm. Add in a 100% money back guarantee and this isn’t a bad choice at all. A good budget option, the hand chainsaw from BlueStraw features high quality steel teeth using sharks as an inspiration to create a dense row of teeth to really cut through the wood. These blades are made from a steel alloy that is made to be durable and last a long time. They are sharp and make for a pretty good cut. Two plastic handles are molded to provide as ergonomic a grip as possible. The flexible design means this saw can be folded and put into the pocket, rolled up into the pouch, or carried in whatever way you see as appropriate. This saw is lightweight, small, and is easy to carry, store, or use. This is a great option that handles all the basic needs of a pocket chainsaw while also being included with a magnesium based fire starter and comes at a price that won’t bust anyone’s budget. The handles are made out of rubber. While some will prefer these to the strap handles that the majority of pocket chainsaws will have, I see that as a potential con. The ergonomic design might not fit your hand and if one breaks – good luck on replacement. That said, this is a solid 29-inch folding chainsaw that is worthy of making this list. This is a really unique setup for a pocket chainsaw and it’s one of those that I like a lot. I wish I could love it, but there’s a really obvious flaw that prevents me from being able to go that far. But before getting to that let’s review Skyocean’s take on a good survival pocket chainsaw. This survival chainsaw is great for emergencies, bushcraft, or survival gear. Easily foldable and lightweight, it’s easy to carry around and right there for use when you need it. The saw blade on these is 24 inches while there are 7 inches of handles. It is flexible with a bi-directional cut and is good for thick logs, branches, and when absolutely necessary even certain sized trees. This saw hits all the basic checklist points but that’s obviously not what jumps out. 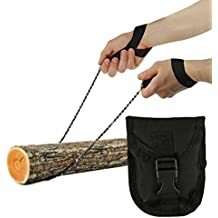 The paracord handles jump out as making this a true survival saw, which in theory I love BUT…if you undo the handles for use with lashings for shelter or clothesline or fishing line or traps or whatever else…how do you use the saw at that point? It’s one of those things where the philosophy behind it is absolutely fantastic but I wonder how it actually works in practicality. 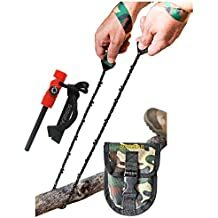 What are the chances that you would be in a survival situation and somehow know every little bit of cutting you wanted to do before taking the handles apart to use the paracord? Q: Are these pocket chain saws the best survival saw option? Q: What are the biggest pros of pocket chainsaws? A: These are very light, very compact, and give you some serious cutting ability that you can carry around. This gives you many more options in camping and survival situations that you might not otherwise have. They’re very inexpensive and being manually powered means no worries about gas shortages. Q: What are the biggest cons of pocket chainsaws? A: They do require a decent amount of manual strength and stamina, don’t have the cutting ability of regular chainsaws, and aren’t always even a better option than a folding bow saw or folding saw. Q: Who wins comparing a pocket chain saw vs. wire saw? A: Wire saws were never anyone’s #1 choice for a survival saw but when you had no other option they would do in a pinch. A pocket chain saw cuts much faster, cleaner, and better than a wire saw and is far less likely to break or dull down from cutting. It’s clearly the next step in the evolution of this type of survival saw. Q: Which is a better option when comparing a pocket chain saw vs. bow saw? A: I’m actually a tremendous fan of bow saws and there’s no shame in saying that the true top of the line bow saws or folding versions are my top pick if I only get one saw and that is even true if I can prepare for a bushcraft or remote wilderness situation. The design is popular for a reason but it’s also larger and bulkier. In the specific situation of always having a saw on hand, especially if you’re going to be in any situation that could turn into survival or stranded, that’s where the pocket chainsaw really comes into play. Q: How does a pocket chainsaw compare to a camping ax or hatchet? A: They’re not nearly as good, but in fairness the design for a good ax or hatchet is for a permanent tool. These are designed to last decades and are built as a tried and true tool. Pocket chainsaws aren’t meant as a replacement, but as an emergency fill-in. Q: Pocket chainsaw vs. folding saw: which is better? A: Around the house or for everyday use I’d say the folding saw is more practical as an everyday trimming instrument. Pocket chainsaws are often much easier to carry since they come in small pouches, making them a bit more ideal for many far in the woods or survival situations. That being said, a lot will depend on the quality of the brand in each case, the area they’re being used in, personal preference, and the situation at hand. I like having both, but if it’s one or another for home use go with a folding saw. If it’s for emergency use and space is a premium go with a pocket chainsaw. Q: What is the best length for a pocket chainsaw? A: This will be a bit of a preference thing. 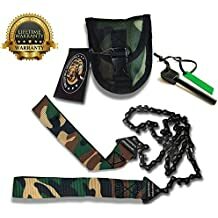 The standard size for a good survival pocket chain saw is 24 inches but I’m personally a fan of 36 inches because of the extra length gives reach, leverage, and a little bit more versatility that you can work with. This isn’t a tool I would use on a regular basis, but as a pure survival saw or a tool to carry along in the bush just in case you need it, the higher end models can definitely provide some serious benefit that is going to help when you need to break down some larger wood…but don’t expect to do it without working up a sweat!